Seen on the rock wall outside Harvest Inn, St. Helena, CA. Either holding something or the bill is very overgrown. Maybe it's an odd overgrown bill, but I know it was the bill because the bird moved to different places and always seemed to be using the bill to dig under the rocks searching for something. It was a very long curved bill. It looked very much like the woodpeckers we have here but much smaller - did not look like a juvenile; about the size of a robin. most mysterious. 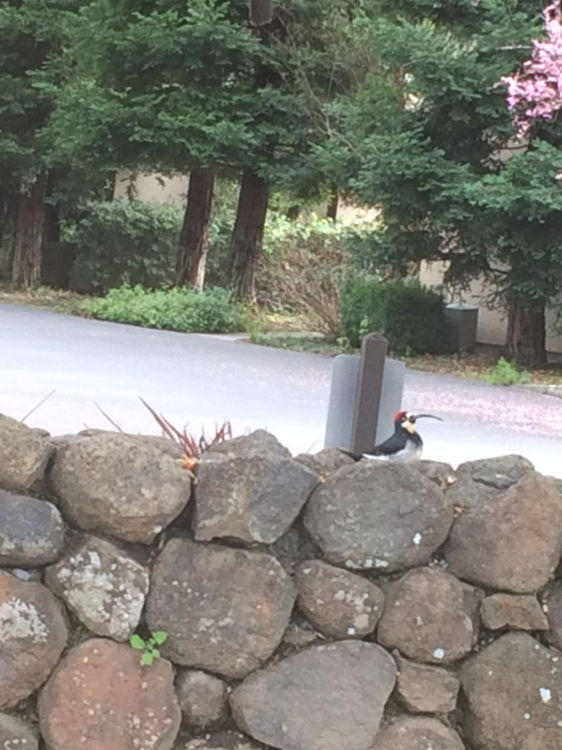 We've lived here since the early 70's and have never seen any bird like it before. Thanks for all your fast quick help. Any other thoughts are welcome. If you can, get more pictures if you see it again. That would be an insane bill for that bird. Thank you all for your comments. I came across this forum quite by chance (looking to identify this bird) and I think it will be most informative and great fun! Dear Millipede - I'll certainly get more photos if I can - fascinating. Of course, I could do what the way-back-when bird identifiers did: kill it and then scrutinize. Seems awfully cruel and I'm sure glad we don't id creatures that way any more!